Just thought I would share with you my freshly re-trimmed steering wheel from Royal Steering Wheels. Couldn't be happier with it! It feels lovely in the hands and is now the perfect thickness for me. Top notch quality work too, even better than OEM! How easy was it to swap over? Royal Steering Wheels did the fitting for me whilst I waited. Only took about 10 minutes to swap over! Ahhh bit far for me,would be about a 400 mile round trip. Yeah, it’s relatively straight forward, but last time I removed a airbag it was a bit of a pain, albeit it that was a first gen F21. Nice I’m thinking about doing something similar, would you have to inform car insurance about re-trimmed steering wheel? Just how I would like mine done but with the top strip in red. Undecided on stitching though. What was the cost did you keep your original? Couldn't be easier on the new style wheel, I wrote a How To a while back. 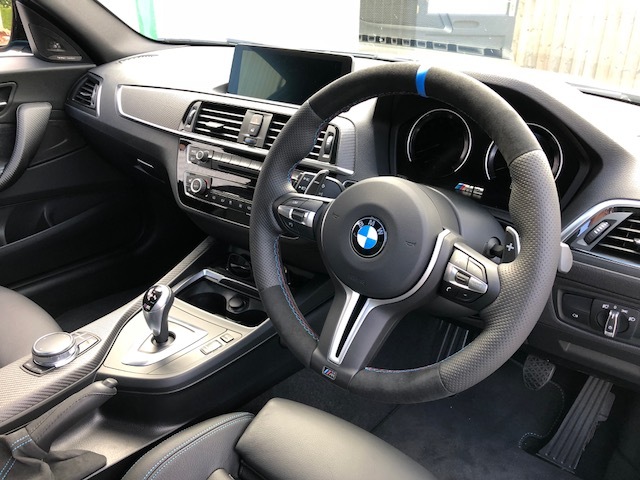 Tempted to look at options, find the M2 wheel too think, M240i wheel feels nicer re thickness.